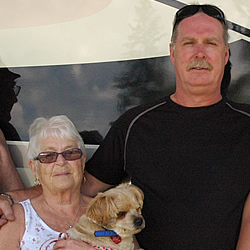 Cindy Anthony and Robert Martin of southern Alberta were making a loop through southeastern B.C. when they stopped at Walmart in Cranbrook and took a few minutes to chat with us. What brings you to B.C.? We’re originally from Vanderhoof, B.C., and we love the mountains and the water. The smells of B.C. air make me feel like I’m back at home. Tell me about your RV. It’s a 37-foot Thor Outlaw. We bought it in July this year and have been out in it every weekend. It allows us to travel comfortably with the kids. 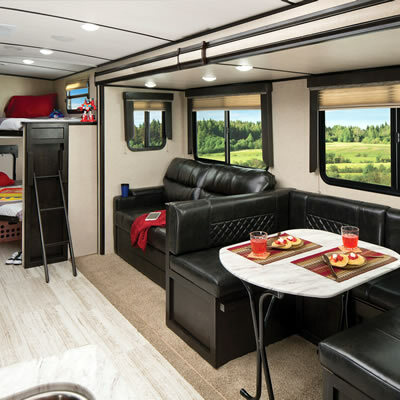 The toy hauler gives us extra space to carry the cribs and high chairs and strollers and actual toys. What do you like about RVing? It forces us to put some distance between ourselves and our business, so we get a break, though we still are available by phone. I’m looking forward to taking the rig on the road with the children and their nanny, to visit my parents in Vanderhoof. 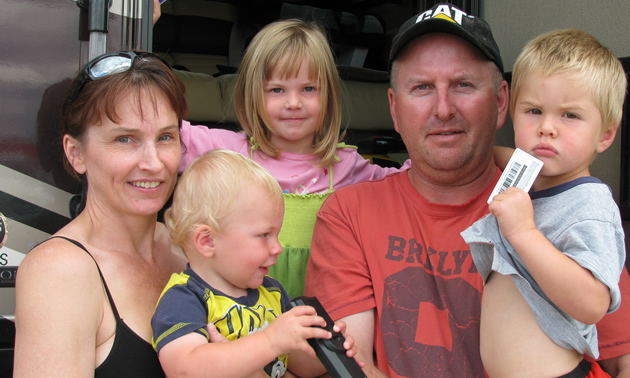 Golf and local festivals are the reason the Hayes and Lukin families return to Cranbrook. 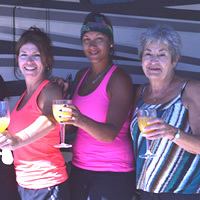 This Alberta family has established a tradition of annual summer reunions at Fairmont Hot Springs Resort RV Park; we spoke with Jennifer Williams about their trips.